Our Midweek Brock University is based on the PADI Open Water Diver course, which is the first in a series of progressive scuba diving programs through our award-winning 5-star PADI Dive Center. Our PADI Open Water course at Brock University is designed to provide a strong foundation for student divers with no prior diving experience. You’ll notice that our divers look different underwater than the way most other divers do. 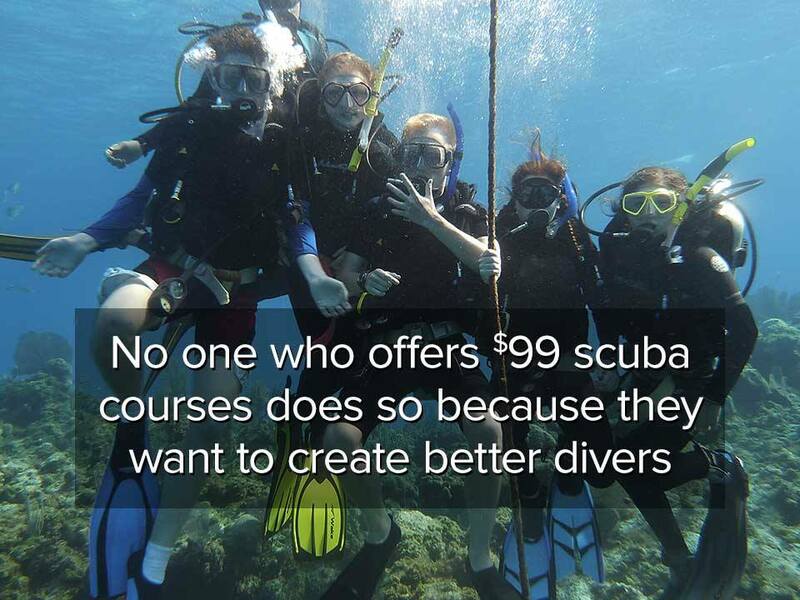 This is because less than 5% of the shops and instructors teach any sort of progressive diving philosophies. Many divers who are in a leadership role such as a Divemaster or Instructor haven’t furthered their own personal diving experiences beyond recreational diving or kept up with current trends in the diving industry. Most of our staff are certified Cave and Technical Divers or Explorers which are the most challenging personal diving achievements one can attain. Don’t settle for an inferior course that introduces you to antiquated skills and techniques. You owe it to yourself to get the best training you can, to learn the most modern and progressive diving techniques. Learn to dive in and purchase the right equipment configuration rather than several choices that you’ll outgrow quickly, as well as to enjoy your dive experience to the highest level, learning the right skills, finesse and in water control to enjoy your underwater experience to the fullest. Here at Dan’s you’ll learn how the right equipment configuration and sound foundation skills can set the stage for diving excellence. Buoyancy and your control in the water affect everything you do. Why not learn how to dive smarter not harder? Benefit from learning to use the right gear and techniques from the beginning. What Diver Would YOU Rather Be? Ask Yourself which kind of a Scuba Diver would you want to be like underwater? Check out the following 2 videos showing Progressive Diving (the way Dan’s Dive Shop Teaches) versus Traditional Recreational Diving (the outdated way everyone else teaches). DDS has done it again! We are offering a brand new format that allows divers to complete their PADI Classwork Online. Watch the Videos, complete the quizzes and then book your classroom sessions, pool and open waters with us! While a lot of stores and instructors are using eLearning to take the place of a formal classroom setting, we have created an entirely new curriculum that enhances the PADI program and shows students a number of new topics that inspire, inform and further develop the divers academic mind, while introducing a series of clinics, dry-land drills and much more to create a more thinking diver. Brock is a great option for students wanting a course that is broken up into more bite size parts. The course duration is generally 5-6 weeks Wednesday nights during the winter season, or over 3 weeks Tuesday/Thursdays in the summer season. Open Water Dives are required for Open Water certification and are included in your full course price and completed locally unless you choose our Open Water Referral Program. Most divers feel more comfortable completing their open water dives with DDS staff after seeing the difference we can make in your diving career. Group or Private Instruction is available. DDS Progressive Open Water Diver Course $500 + HST includes PADI Open Water Materials, Certification fees, ALL Scuba equipment rentals for pool and open water sessions. We will supply you with a PIN Number for activation of your PADI eLearning code. Materials include PADI Deluxe Multi-Media Crewpak with Digital Manual, Online Videos, Virtual Dive Table, Dive Computer Simulator and PADI Online Logbook through the PADI app. 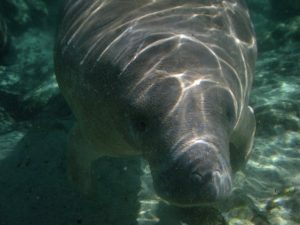 Please do not purchase PADI eLearning on your own or costs will be higher. Paper books are still available for a limited time if you’d prefer, however, they’re being phased out in the coming courses. 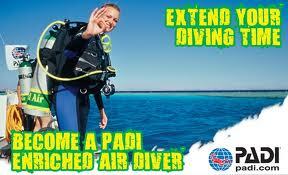 PADI Open Water Referral Program $350+HST is designed for students who wish to complete certification down south. Includes PADI eLearning, all classroom and pool training, as well as scuba equipment rental for all pool sessions. Please note that your destination will charge you additionally for the certification dives. For this reason many divers often decide to upgrade to our Open Water Checkout Dives Package to complete their open waters with us after seeing just how different and how much more progressive our dive training is. Being a Progressive Dive Shop who’s been in business for over 40 years we can help in selecting the right store for you to do your referral through, or you can join us on one of our amazing winter trips and certify with us and maintain the same quality, consistency, configuration and techniques that only a select few educators offer world wide. We also recommend you take our gear down south with you on your trip to maximize your comfort and maintain a positive experience in favour of using old, outdated bcds and regulators that don’t fall within the guidelines of our progressive training style. PADI Open Water Check Out Dives are ideal for divers who have completed their classroom and pool dives elsewhere or wish to upgrade from our Open Water Referral Program. If you’re new to DDS and our philosophies we will have you complete an equipment configuration and skills orientation to introduce you to new skills, techniques and gear configuration not covered by your previous training followed by your certification dives. This workshop covers a classroom and in water pool evaluation where you will learn new foundation skills, trim, posture, buoyancy, proper fin kicks and be able to execute them without standing or kneeling on the bottom. Cost is $85.00 +HST. Cost is only $200 for the open water dives including your certification card, open water dive equipment rental is also included (Backplate, Regulator, Tanks, Dive Computer, Exposure suit with hood, gloves, weights). Additional Benefits: If you decide to purchase your scuba equipment package from us to use on your pool and open water dives we’ll give you a $100 credit to your next purchase. If you purchase your gear to use for your open water dives we will give you a $50 credit towards your next purchase. We can accept students from any accredited dive training agency including: PADI, NAUI, SDI, SSI, GUE, UTD, IDREO, DD4all, ACUC, SEI and more. Private and Semi-private courses are also available at a slightly higher cost. Students will need to purchase their own Mask, Strap Fins, Snorkel, Boots, it is also highly recommended to purchase a surface marker and spool, especially if traveling south. You’ll want to buy the right gear, so please have a read through our DDS Student Diver PDF and learn more about the specific gear requirements and training differences we offer. If you want to read more about gear, training and techniques check out our Blog. Students purchasing their own scuba equipment package from us (regulator, computer, buoyancy system) will be issued a Dan’s Dive Shop Gift Certificate in lieu of using our rental gear. The Gift Card can be used towards your next purchase of training or equipment. Dan’s is proud to offer the Largest Selection and Best Pricing available on all quality brand name Scuba and Snorkeling Equipment. Experience diving smarter, not harder! 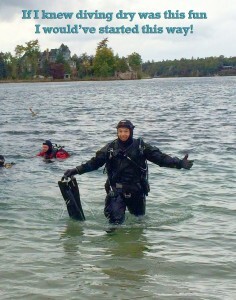 Dry is more comfortable, less effort, warmer and extends your dive season! For students wishing to be warmer, drier and more comfortable during open water training dives, you can take advantage of diving dry in a DUI drysuit and experience how much more fun and enjoyable drysuit diving is. Add $175.00+HST to above course fee. Includes PADI Drysuit Diver Materials. Enriched Air Nitrox Option for students enrolled in the open water program who would like to have more energy between, during and after diving, Nitrox will wake you up and make you feel better and allow you to gain more bottom time staying down longer underwater. Cost is only $150.00+HST includes nitrox manual, specialty certification card, nitrox tank rentals for open water dives. Here are some popular courses divers are often interested in taking after Open Water. Want to know more about PADI Open Water Brock Scuba Diving Course?